True Swords has an unprecedented savings opportunity for you with our first-ever bargain basement scratch & dent inventory reduction sale. 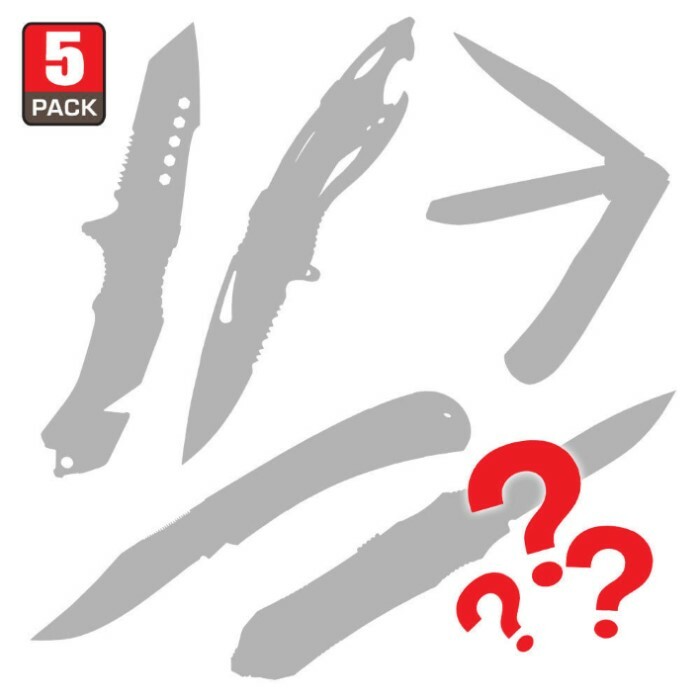 This scratch and dent grab-and-go five-piece Pocket Knives Mystery Bag brings you five pocket knives at one low price! For less than $13, you'll receive a combination of five pocket knives in this mystery bag. We've found a stash of scratch & dent pieces that are still in full working order, and we're passing along this opportunity for incredible savings to you. Pick up four blades for less than $3 each! This satisfies my new blade fiending. I love it. A couple of economy blades to beat on for a meager price. I've even given them as gifts. Sometimes they are scratched but usually I cannot find anything wrong. Like a knife lottery. Always enjoy getting these deals! Thanks Budk for allowing your customers to take advantage of these special offers! I know when I buy a scratch and dent lot that its a gamble. After all, for Me its fun to open the package not knowing what I'm going to get. at the price point, its not breaking the bank and allows me to add more interesting knifes to my collection! One of these was the typical made in China junk you expect. The other 3 were individually worth the price I paid for the set. One is going in my pocket to replace the Old Timer I usually carry. Although they are good knifes I have personal problems with the Commemorative POW/MIA knife made in china and the Vietnam Veteran Limited edition made in China, my grandfather was a POW/MIA in Burma during WWII and my Father was a Green Beret Paratrooper in Korea, I have a lot of friends who were in Vietnam, The POW/MIA Commemorative knife will go in a fishing tackle box or one of my tool boxes because I would be too embarrassed to give it to someone I know. The Vietnam Veteran serialized limited edition I will grind off the "handcrafted in China" with a diamond dremel bit to make it look like an underscore to the words "stainless steel" written above it and give it to a Vietnam Vet who is a friend who is to this day is proud to have served his country. Well, what was interesting was that there were actually more than 10 pieces in my purchase of two bags. 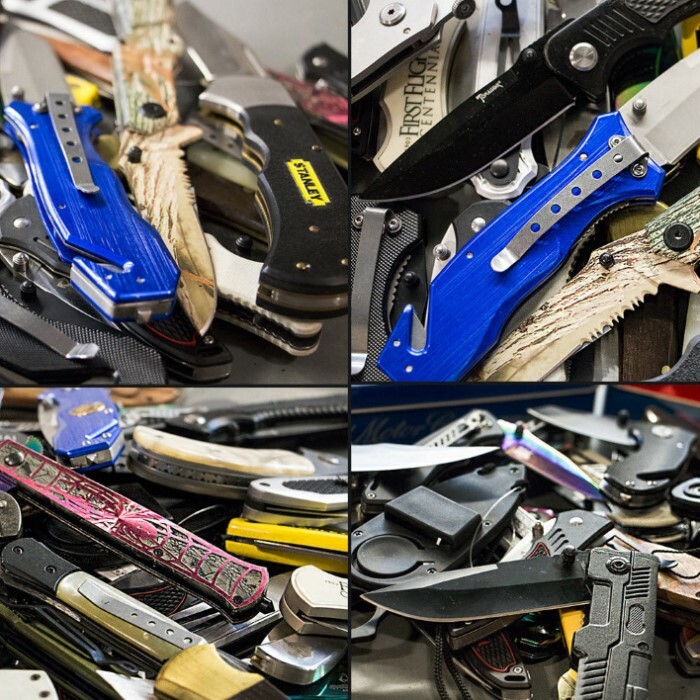 However, some of these were really cheap folders, that are bought in lots when new, like the trophy master folder (two pieces came in pairs, one piece came as just one knife) or this pair of ridge runner mini knives which are useful, but cheap. There were also two of these tomahawk brand knives with plastic handles and sticker peeling off... The things I liked were were two assisted open knives, which were about $10 ea, and two of these knives which had two blades each. But one was dirty, while the other had a cracked handle. Overall, you get what you pay for... which is not too bad... But usually, bogo offers are better. Honestly not that bad of the deal. I got 2 knives that were pretty nice and both added up to be over the $12.99 price. the rest ill probably give away to my brothers and sisters but other than that not to much i could complain about! great deal for $13 bucks! I got 2 of these packs. Inside I got 4 of the same knife with a deer on it. I think I would be too worried to buy another one of these mystery grab bags. I had only 1 knife inside both of those packs that I will want to keep and the rest I will try to give away to my friends that I dont care about that much. On the + side of things there were almost no scratches or dents!